For those that appreciate a coffee brewing system that involves no breakable carafe, yet still keeps the brew nice and hot for serving, this model in the Brewstation Plus line can provide the solution. 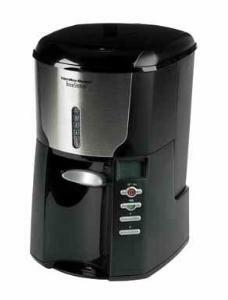 Hamilton Beach has a whole selection of Brewstation coffeemakers. The feature they all share is a dispensing system that eliminates the coffeepot, be it a glass carafe or thermal version. Everyone knows how skunky and burnt-tasting coffee can become after hours on the hotplate, not to mention the fragility of those glass carafes. The Brewstation Plus model brews up the standard 12-cup amount of coffee and keeps it warm in a thermal insulated dispenser. You just draw it one cup at a time. The dispenser is roomy enough to accommodate a tall travel mug as well. This unit has simple controls and a digital display with a programmable clock for timed brewing. There is a two hour auto-shutoff feature as well. The inner water container is removable for filling at the sink and all internal components dissasemble for cleaning. It wins no awards for looks or style however. This model is decidedly square and uninspiring in design, with the display and controls mounted off center, limiting where this can sit on your counter for convenience. Still, simplicity sells and this unit gets points for pure utility without too many controls. Compare with this digital Cuisinart coffeemaker.